As the options for personal computing have expanded over the last decade, the tablet sits (sometimes awkwardly) in every category. Running Android or iOS sometimes make tablets feels like just a big phone (as the original iPad got criticized for being). But you can also slap a keyboard on it and you’ve got something that resembles a laptop. Lastly, most tablets are multi-functional enough to let you forget your e-reader at home. You may not have heard of the LG G Pad X 8.0 (which yes, is an unfortunate name), but it’s a new midrange tablet from LG available exclusively for T-Mobile. At first glance the LG G Pad X 8.0 appears to be a well-balanced multi-tool that with features like a mid-sized screen, mid-range processor, and LTE connectivity for under $240. You can pick it up at that price, but it also comes bundled in a few different service packages. When LG initially released the LG G5, their customized interface removed the app drawer and dropped all your icons on the desktop in a similar fashion to the iPhone. Since this was LG’s flagship product, a significant number of early adopters were power users who missed the app drawer. LG quickly added it back in. With its mid-range specs the LG G Pad X 8.0 isn’t going after that same high-end market, so the app drawer is gone again. It looks for good this time as there is no way to re-enable it. Power users shouldn’t have trouble downloading a launcher replacement like Nova to give them back that flexibility. Multi-window is built into this version of Android, but only as an experimental component. LG has built the enabled the feature in their skin, but it still doesn’t feel ready for Prime Time. Only a handful of apps support the feature and they’re Google’s built-in apps. The 3rd party apps you want to use (like Netflix) aren’t supported. Play Movies and YouTube are supported, but the experience is glitchy. It’s far from what Apple has been able to accomplish with Picture-in-picture. When Android N shows up later this year it will hopefully come with a more refined multi-window experience, possibly including PiP and freeform windows and more app support. Until then (and until we get word that LG will update this device), multi-window is just not well executed here. Honestly, there’s not much special about this tablet in the software department. The interface is clean and fairly close to stock. The built-in apps add some functionality but they don’t add much value. The hardware, however, is another story. The design of this new G Pad X tablet is fairly straightforward if you’ve ever used a midrange tablet before. Fortunately, most manufacturers have moved away from the glossy, cheap plastic look of the past—and here LG uses a textured plastic that feels grippy and doesn’t look half bad either. It doesn’t have the beautiful design and high quality materials of the LG G5, but that doesn’t mean you’ll be embarrassed to carry this thing around. Under the hood is a Qualcomm Snapdragon 615 Octa-Core at 1.5GHz with 2GB of RAM. What the hell does that mean? It means that it’s a mid-range performer in the current generation of processors. It’s like getting the mid-range make of a late-model car. It’s slower, but still has all the bells and whistles of the top end smartphones and tablets. For example, the eight-core CPU is better described as two, four-core processors. One set is designed to do the heavy lifting when you’re shooting videos or playing games. The other set is designed to sip power from the battery while it’s checking for Facebook updates on your end table. That versatility gives you considerable power on-demand with a week-long battery when used moderately. Connectivity options are all cutting-edge. Wi-Fi 802.11ac, Bluetooth 4.2, and there is even LTE through T-Mobile which—by no coincidence—is the only place you can buy an LG G Pad X 8.0. The version tested for this review is the Canadian model which works on the Rogers network and is sold as the LG G Pad III 8.0. Considering the list price is under $240 in both countries, that makes it one of the cheapest LTE tablets on the market. By comparison the cheapest LTE iPad sells for more than three times as much. It’s also by far the fastest and most feature-rich in this price bracket. Storage on the LG G Pad X 8.0 is a mix of great ideas and one terrible limitation. The tablet comes with a standard 16GB of storage. The easily accessible microSD card pops in the side without rebooting, and supports up to 128GB of extra storage. A unique feature of this tablet is the full-size USB 2.0 port on the top of the device. I tested a keyboard, mouse, USB stick, and even external hard drives and everything worked without a hitch. The G Pad X 8.0 was even able to play HD video from an external 3TB drive formatted with NTFS. It takes a very, very long time upon connecting to the hard drive to catalog the files, but reading and writing to multi-terabyte drives is something very few Android devices can do. Strapping this tablet to a powered USB dock we were able to access all of these peripherals and more at once. There’s one terrible limitation that will disappoint you if you’re hoping to do more with this seemingly infinite storage than store movies and music. Some versions of Android let you move apps to external memory, yet LG’s does not. Which brings up a bigger question: why do smartphones and tablets still ship with 16GB of internal storage? The OS eats up almost half of that, and of the remaining space a basic collection of apps can eat up another half. Before you’ve added any of your favorite games, the LG G Pad X 8.0 only has a few gigabytes of room left. 16GB is anemic for internal storage in 2016, even for low-to-mid-range devices. What makes it worse is that the device comes with an SD slot, but it’s been locked down for external use only, meaning you can’t put apps on it. Even though you can easily connect terabytes of storage to the LG G Pad X8, that’s not the most impressive hardware. At first glance, the 8-inch screen is just another stepping stone between premium 10-inch screens and bargain-basement 7-inch tablets. With 1920×1200 pixels the display is slightly sharper than your HDTV and the extra pixels are very helpful when using as an e-reader. Although it’s not technically being sold as an e-reader, there are several reasons why the LG G Pad X 8.0 works really well as one. First off, the 8-inch screen is a perfect balance between large enough to read and small enough to be portable. 10-inch tablets are great for full pages of text, but at 0.68 pounds, the LG G Pad X 8.0 weighs less than half the iPad and even less than the 7-inch iPad Mini. The full HD resolution makes pixels imperceptible while holding the tablet at a standard reading distance. The aspect ratio is 16:10 instead of 16:9 (or the iPad’s 4:3). When holding in portrait mode, the screen not only gives you a few more words on each line as compared to 16:9 tablets, but is almost perfect for reading digital comics. These reasons are good, but technical in nature. Where any good tablet excels is in what makes it unique. At the top of the right side are four buttons; power, volume up, volume down, and a programmable button set to “Reader Mode” by default. With with a single tap of that button, the harsh blue light backlight is replaced by a softer sepia and the color is almost completely desaturated. Late-night reading need not interrupt your sleeping. Dedicated e-readers like Kindle use e-ink screens to eliminate glare and provide a more natural reading experience, and newer models even include backlighting. However, they continue to function as a reading device and little else. If you love digging into your books on an e-reader, the Reader Mode on the LG G Pad X 8.0 may or may not change your mind about tablets. However, it does open your options to include full-color comics, videos, and apps all in one device. We’re impressed that the specs in the LG G Pad X 8.0 are partnered with a price only a fraction of the competition. You might wonder what you’re giving up. There’s no aircraft-grade aluminum, just a plastic case. The bezel that surrounds the screen is a bit wide when compared with the competition. The processor and RAM are firmly mid-range, but can keep up with current needs. Our 3D benchmarking returned poor results. Perhaps most disappointing is that apps are limited to the 16GB internal memory. The very first generation of smartphones had 16GB of storage and nearly a decade later we’re still squeezing into those tight shoes. My hope is that LG sees the light and lets you access some of that wealth of storage space available to this tablet. So what do you get if you can live with those limitations? A tablet that rivals budget tablets in price and portability, yet has a screen that rivals full-sized tablets. The most current wireless connectivity options are built in, including LTE. Even though internal memory for app storage is limited, external media storage is nearly limitless with microSD and a full size USB 2.0 port. That USB port can also be used to connect a mouse, keyboard, or all of the above through a powered USB hub. As an e-reader, it’s the most balanced mix of large screen and portable size you’ll find in an Android tablet. The bright screen works well even outside—though you may want to find some shade. 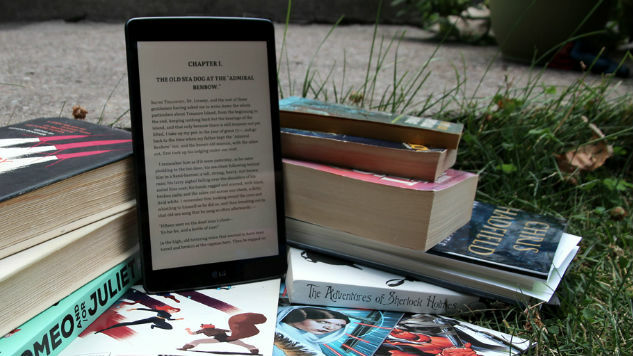 However, the Reading Mode makes late-night reading easy on the eyes, and the versatility of Android 6.0 Marshmallow lets you read e-books from almost any digital bookshelf out there including comics. Regardless of what you’re wanting to use it for, the LG G Pad X 8.0 is one of the best budget tablets we’ve used in a while.